The St. Pete Tiny Home Festival is one of our favorites for several reasons. One, it’s close to home. We’re based in St. Petersburg, so this is our (tiny) ‘home festival’. Two, it’s in March, so you couldn’t ask for better weather (except for the pollen making everyone a sniffling, red-eyed mess.) 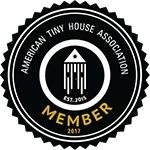 And three, it’s full of fantastic examples of tiny living and a market featuring tiny home products as well as arts, crafts, and some of the area’s best food trucks. It’s a popular show so the lines get long, but these are professionals so they move along pretty quickly. It’s always good to see old friends and meet some new ones!